The idea of disorienting the player was not part of Essen's original concept. "As I was making it, I just started noticing it," he says. His original plan was to make the game less playable the further you got; the screen would rotate and parts of it would be randomly covered. He axed the latter, however, because "the rotation made more sense to keep in. The game wasn't cheating you that way, so you just get angry and sick by your own means. Purposefully making the player dizzy wasn't something I'd seen before, so it seemed worth doing." The game wasn't cheating you that way? Are his games actually designed to be fair? "Yeah, absolutely," he tells me. "I think they're all fair - there might be one or two that have their own logic, but you're not getting killed by something off-screen. It's pretty clear that it's always your fault." Most of his post-Punishment work has featured similar concepts. They subject players to a sensory assault, while at the same time forcing them to confront extremely difficult (though never unfair) challenges. But Essen isn't a sadist. "I think the games that were the most fun for me growing up were the ones where figuring out how to move your character was the most challenging part, or the part you could inject the most personality into," he says. His game Flywrench fits that description perfectly. In between spasms of flashing colors and music that sounds like a remixed dial-up modem, you must figure out the correct way to move your ship through obstacle-ridden environments. The most challenging part is simply getting the moves down. Essen's games aren't always about the challenge of accomplishing goals. 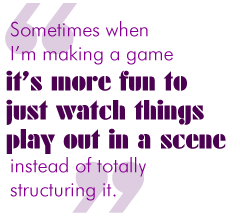 "Sometimes when I'm making a game it's more fun to just watch things play out in a scene instead of totally structuring it," he says. "Like in Scrap Collector it's all about experiencing these exhilarating dogfights. There's a lot of monotonous platforming until you get to that point, but then the game sort of stops and there aren't any more goals except playing around with these rocket planes." The concept of making a game that is more of an experience than a challenge works well with Essen's two-player game design ideas. Take Cowboyana, for instance. In it, two players wade through an endless stream of vignettes about cowboy life: shooting each other in the back, getting drunk and robbing trains, among other things. "There were a bunch of scenes I wanted to do, but connecting them all seemed like a lot of useless filler that would just slow the game down," Essen says. "Cowboy scenes are sort of interchangeable anyway, so it just jumps around through them, leaving it up to the interactions between the two people playing to keep it varied." Each scene is book-ended by cowboy poetry that is at times depressing, at times hilarious.